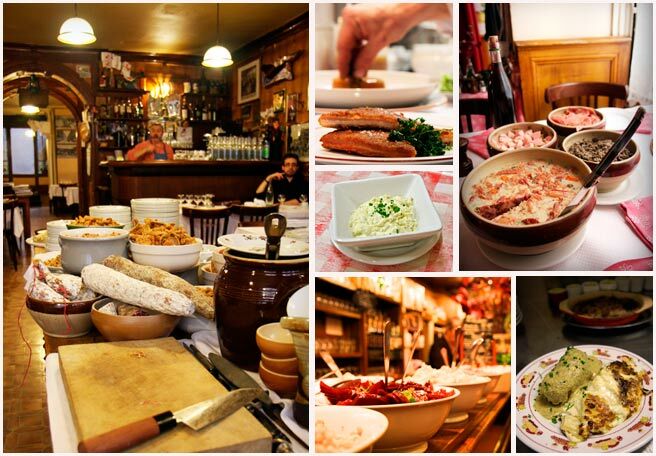 On a visit to Lyon, you can have one great meal in a bouchon, and this can be a definitive event. Your first meal in a bouchon tends to form an imprint. The dining experience is so unique and your gustatory pleasure has been so aroused that it extends down to the place in your mind for memories that will eventually become life stories. The next place simply can't measure up. You might sink your spoon delicately into the majestic communal creme caramel at Chez Paul and from then on out, any bouchon that doesn't have it, isn't... perfect. You might feel enveloped in good cheer at Le Garet and then never feel that satisfaction the same way anywhere else. You might get that tangy delicious poulet au vinaigre that seems to set off a delicate counterpoint with the austere flourescent-lit hole-in-the-wall atmosphere at Cafe des Federations. After that, nothing can compete. Legends are born from these gustatory milestones in the mind of a food enthusiast well after they've had a chance to simmer and mijote, mixed with the delight and relish in telling the story again. 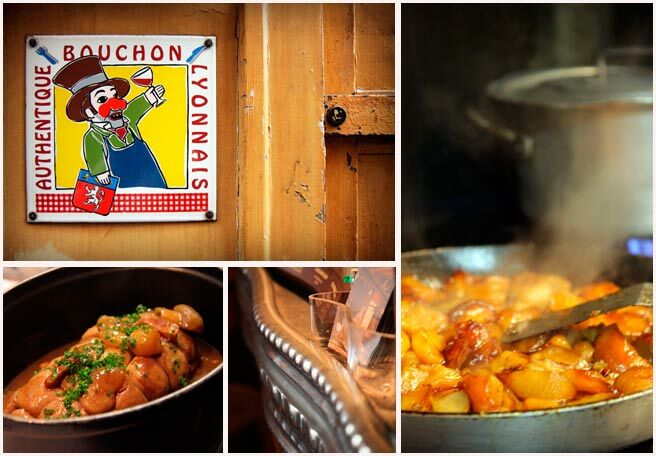 In my opinion, every single one of Lyon's official bouchons, the ones bearing the Authentique Bouchon Lyonnais label, are going to build personal rich gustatory memories, but most of all, each bouchon remains unique. The best way for me to explain the authentique Bouchon Lyonnais is to explore what it is as a genre, then get into the nitty gritty of what makes a number of these individual restaurants worth your while. Since this subject is too vast for one post, I am devoting many more to the Lyonnais Bouchon, making it a label. Look forward to the restaurants' stories, their quirks, visual details, menu items, news worth noting, what a Lyonnais bouchon was, is, and what it's not. BTW: love the photos on the left of your blog--great looking food! Really looking forward to reading more of these posts! 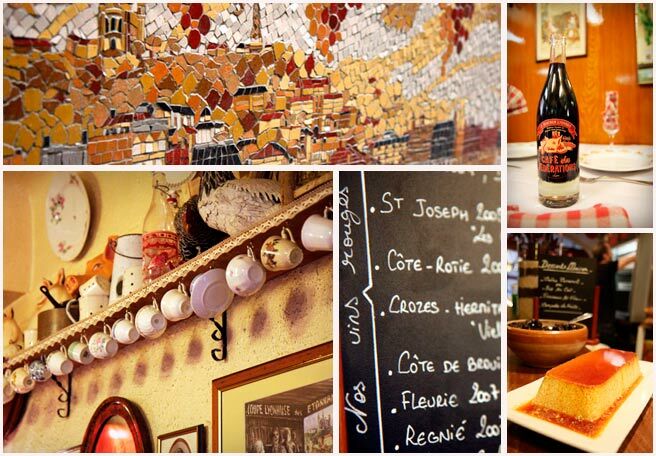 I would love to return to Lyon one day to go to a bouchon. I never got around to trying out Le Bouchon des Filles. Mmmm, you're going to make me so hungry I may have to hop on a train soon! It all looks so delicious. And the photography is amazingly good. I look forward to learning more about these fantastic places. I love the Bouchons in Lyon. Some of the best meals I had in that fabulous city & I always made sure to take friends when they came to visit. I can't wait to read more about them in your coming posts. I miss Lyon very much. Just discovered your blog! Great shots! It makes me want to jump on a plane... you are a one-person tourist board for Lyon! since I'm the luckiest from all of us because I live in Geneva.... I look forward getting all the great bouchons address :). I've read about Bouchons in Lyon that specialised in offal. Are Bouchons generally kid friendly? My taste buds are gearing up just at the thought! How glad I am to have discovered your blog. looking at these pictures is a mouth watering experience! just found your blog thru Facebook. I will be reading this one frequently. Love it. The pictures are awesome as well. My wife and I are preparing to move to Lyon in the next 2-3 months. Your blog is enough to get our mouths watering! Beautiful photos! I cannot wait for new entries on this topic! My boyfriend informed me we were going out for a romantic French dinner. We were thoroughly disappointed. The seating was cramped. The server, while friendly, could not explain the difference between two red wines.